How can you say no to these?! Unless crocheting is not your thing. But at least hunt down a crocheter who might make them for you! They are so understated, but seriously add sooooo much to the Christmas vibe in our kitchen. I've been aiming for minimalist cozy decorations this year mostly because a) we don't actually have that many Christmas decorations, b) the extreme red and green everywhere starts to hurt my eyes by the time Christmas comes around, and c) I'd like to keep some of my decorations (like these) up through January as well. 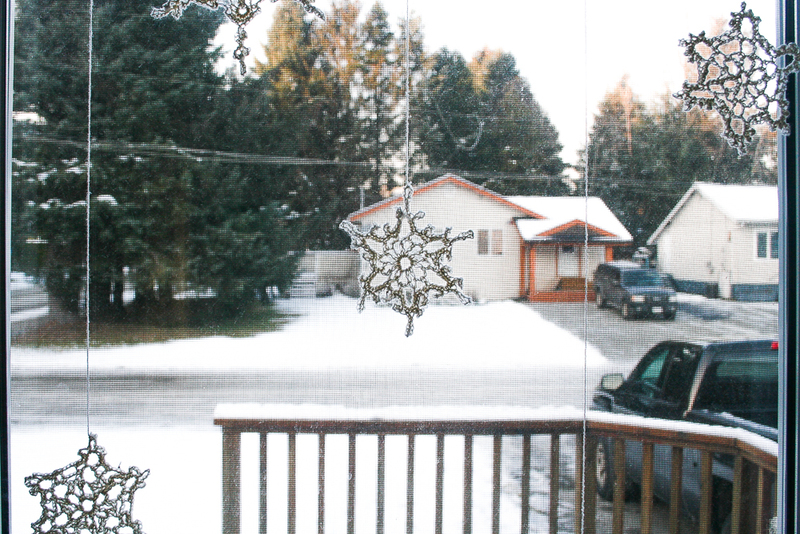 Hopefully they'll remind me that I don't just love the snow at Christmas time. *small crochet hook (1.5-2.25 mm). Here is a really good chart to figure out crochet hook size for different yarns. ​* Lace weight yarn (any kind). 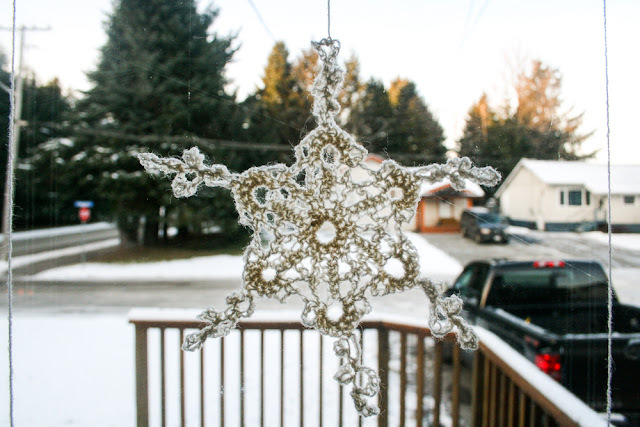 I used a very thin wool yarn that a friend of mine spun up and was getting rid of. 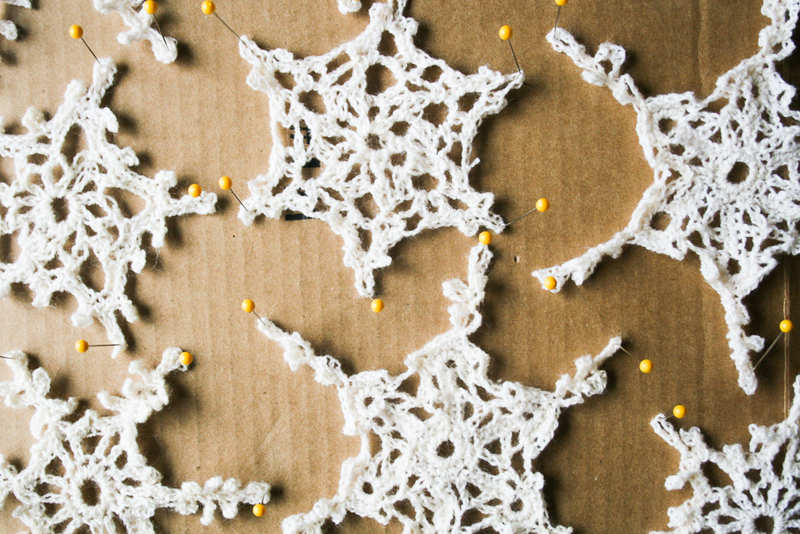 Step 1: Get your pattern and crochet your snowflakes while binge watching Christmas movies (I highly recommend Holiday Inn). They will seem floppy and might curl up a bit, but mine did too so don't worry. 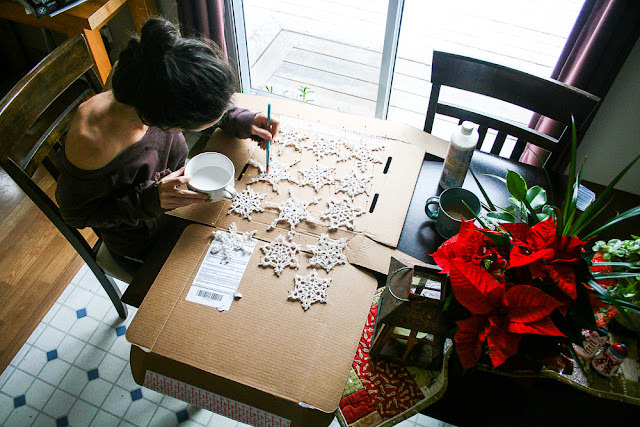 Step 2: Pin down and slightly stretch your snowflakes onto cardboard to reveal their full shape and size. 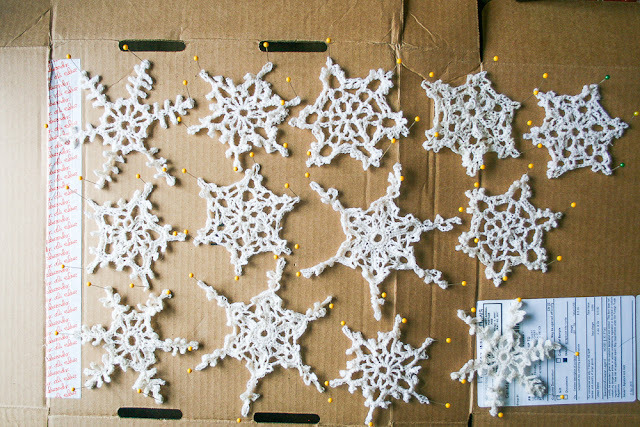 Step 3: Paint your fabric stiffener onto each snowflake, soaking them thoroughly. I was pretty generous with my fabric stiffener which saved me from having to flip them over and painting the other side, but I still recommend painting the other side if you want them super stiff (I hung mine in our kitchen and humidity from cooking has lead to them needing a second coat of the stiffener). Step 4: Leave your snowflakes on the cardboard over night or until you're sure they are completely dry. They will feel stiff and hardened a little. Step 5: Remove your snowflakes from the cardboard and hang them on your windows using your window suction cups. 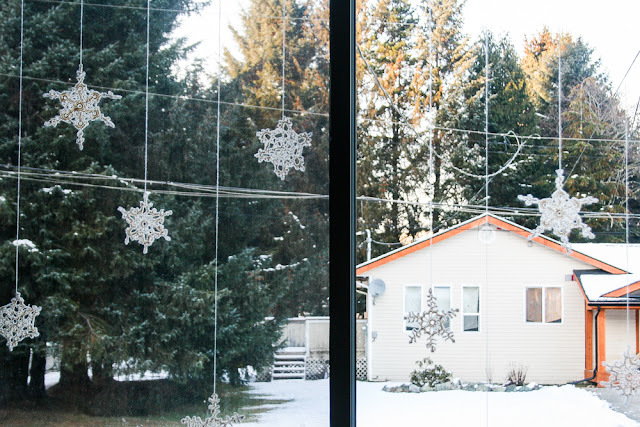 You could also hang these as garland rather than as single hanging snowflakes. I'm sure there are lots of other pretty ways to hang these. They would also look so stunning as ornaments on the Christmas tree! Or attached to a wreath! If you make/have already made these let me know how your using them during the holiday season!